So much yarn, so little time. : Ready, steady, GO! 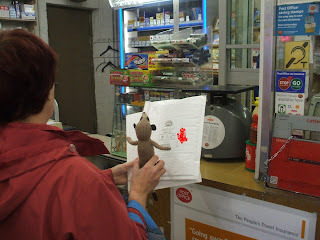 It's OK - knitted meerkats do *NOT* suffocate. 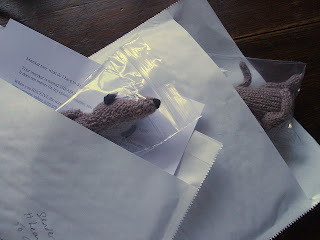 The journey has now begun - each little meerkat has set off on a world tour, visiting 30 (yes, THIRTY!) different members of Etsy's ETTEAM. The various hosts will each be doing something exciting which will be blogged for you, we will be keeping track of their adventures here, and on our ETTEAM blog and even on their very own Facebook fanpage! I wonder where they'll turn up first? Check out ETTEAM's blog later for more details on what this is all about. Am waiting with baited breath..... oh this is exciting. I can't wait for for them to come visit me in sunny Florida! Wonder when they will make it to PA!!! Lots of leaves to play in right now! What a great idea, looking forward to following their travels! Ohhh I can't wait!! I'm so excited to read about the adventures! Are they sailing or flying...lol Looks like they are very cozy.